In the middle of Aladdin’s make-over in to Prince Ali (fabulous he) Ali Ababwa, Genie declares that his fez and vest combo is ‘much too third century’. But on emerging from the lamp, Genie has already announced that ‘ten thousand years will give you such a crick in the neck’. Since Genie has been locked in the lamp for all that time and would be in no position to observe current fashions, this would mean that Aladdin is set in the year 10,300 at the earliest. 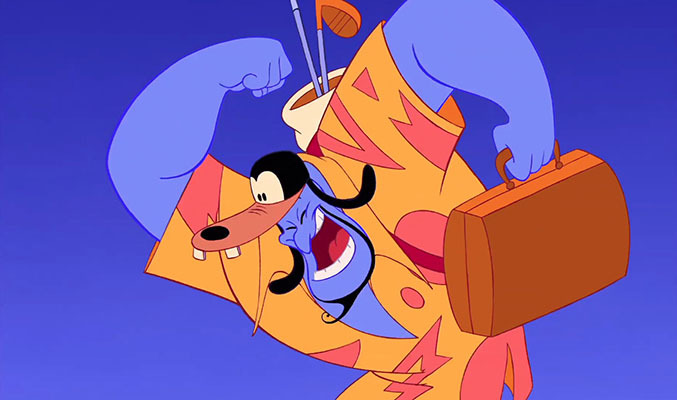 In fact, since Genie is voiced by the ridiculously versatile Robin Williams, he can’t help but impersonate a variety of 20th Century personalities (Arnold Schwarzenegger, Groucho Marx, Rodney Dangerfield, Jack Nicholson – to name a few). This would put the date back even later – meaning Aladdin takes place some time after the year 11,970. This can then be used to rationalise many of the ‘magical’ elements in Aladdin‘s world (though ironically not Genie himself). Similarly, Iago isn’t just another anthropomorphic Disney character. He’s either the result of a society so obsessed with its pets they developed technology to understand their animal’s every thought (why anyone would want these thought expressed in the voice of Gilbert Godfrey is another question entirely) or a mutation caused by nuclear fallout (slightly more likely, assuming that as the daughter of a Sultan, Jasmine would almost certainly get a translator to understand her beloved tiger Rajah). Agrabah isn’t even a real place in the history of the Middle East. Instead it’s assumed this is some form of future corruption of the names Egypt, Arabia and Afghanistan, used as a generalisation since specific nation states are largely irrelevant in the post-apocalyptic wastes. Advocates of the theory have also looked beyond the motion-picture to the Aladdin videogame for more evidence. Finding bones of the nuclear war’s dead, buried 20th Century road signs and even unexploded nuclear devices to support the futurist theory. Finally, some have suggested that there is a monolith to the incredibly historically relevant Nintendo Wii in Aladdin‘s Cave of Wonders, which doesn’t seem to make any sense at all but makes for an entertaining image. So what do we make of this theory? Well obviously it’s nonsense. The theory tries to tie Genie to one time and place when clearly he’s a being with a perception of time very unlike ours. It’s also odd that he would reference the 3rd and 20th Centuries and nothing in between. We could assume that the connecting years were another period of time he spent imprisoned in the lamp, but what are we supposed to make of his obvious trip to Disney World on being granted his freedom? I’ve written plenty about Genie and his crazy time-bending in my 30 Disney Movies That Share A World and Wreck-It Ralph Proves The Disneyverse Is One Giant Computer articles, so I’ll save you by not reiterating them now. Instead, I would like to present two theories that I find much more believable than this Aladdin Theory. Aladdin is definitely set in the past because Belle is reading a book about him in Beauty and the Beast. 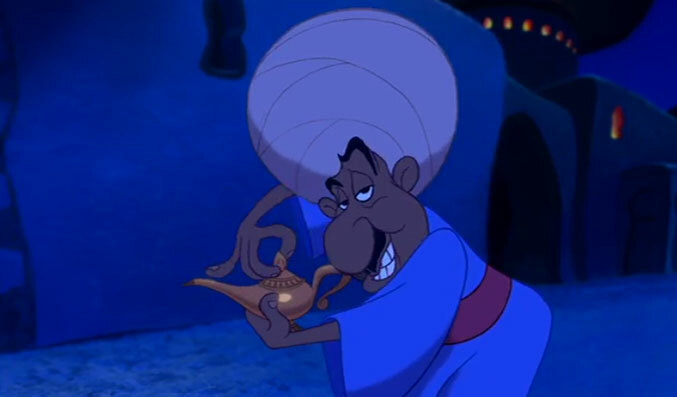 The entire story of Aladdin is made up by the merchant at the beginning to sell you an old lamp. Which is your favourite Aladdin theory? Comments below. This entry was posted in The Disney Theories and tagged Aladdin, Beauty and the Beast, Disney, Games, Head Canons, Movies, Theories. Bookmark the permalink. When belle was checking out the book she wasn’t reading about Aladdin. She was reading about her story. Just look at the movie again. That picture looks nothing like this movie. But I will give u this, they are very similar. Magic spells: do I need to explain this one? But there are more chance of the story ebing really Aladdin, because unless this book only has 3 chapters there is no way it could be Sleeping Beauty ou Beauty and Beast, because both Aurora and Belle discover they fell for princes at the END of the story (well, it is never said that Belle really discovered he was a prince…). come on its so obvious…. -Genie and the merchant are both blue with a red belt. -They both have awesome facial hair. -A witty sense of humor. -And we can infer from the throwing of the stars transition that in a way the merchant could be magical. -And their the only characters in the story with four fingers. Originally they intended for the merchant to officially be Genie in disguise. Not to mention they are both voiced by Robin Williams! I totally love this theory but what about when a whole new world came on and they see them building the pyramids and stuff ? Damn dude, I really liked the apocolypse theory but yeah, you just crushed it with the Pyramids thing. Didn’t remember that. So yeah, this was like 2,000 B.C. Damn dude, as much as I love the apocalypse theory you’re point just crushes it. Pyramids being built = 2,000 B.C. not 10,000 A.D.
You crushed my dreams but you hit the nail on the head. according to some occult theory the pyramids could be a source of energy or some other hidden reason built by the technologically superior ancient races or something like that. so the people in the future could be building them for that purpose . and like the theory suggests Agrabah isn’t a place that exists so there is no pyramid that really exists and we arent talking about Egypt. also the pyramids were built for pharaohs according to history and sultans are mostly historically Islamic. Sultan (/ˈsʌltən/; Arabic: سلطان‎ sulṭān, pronounced [sʊlˈtˤɑːn, solˈtˤɑːn]) is a noble title with several historical meanings. Originally, it was an Arabic abstract noun meaning “strength”, “authority”, “rulership”, derived from the verbal noun سلطة sulṭah, meaning “authority” or “power”. Later, it came to be used as the title of certain rulers who claimed almost full sovereignty in practical terms (i.e., the lack of dependence on any higher ruler), albeit without claiming the overall caliphate, or to refer to a powerful governor of a province within the caliphate. Islam didn’t exist at the time of the building of the pyramids. the buildings architecture also suggest an Islamic presence with the dome styles and settings. so in short the pyramid building does not fault the theory. not that i agree its true or anything . just thought i would throw this in there. ok so my comment was voided because during a whole new world the guy breaks the sphinx and there is also green lands with greek architecture. but it still doesn’t explain the Islamic titles and architecture. and so on which came after the building of the sphinx i’m pretty sure. The Arab historian al-Maqrīzī, writing in the 15th century, attributes the loss of the nose to iconoclasm by Muhammad Sa’im al-Dahr—a Sufi Muslim from the khanqah of Sa’id al-Su’ada—in AD 1378, upon finding the local peasants making offerings to the Sphinx in the hope of increasing their harvest. Enraged, he destroyed the nose, and was later hanged for vandalism. Al-Maqrīzī describes the Sphinx as the “talisman of the Nile” on which the locals believed the flood cycle depended. ok so it was wrong about how the nose was broken but the year would be around 1378 or so Islam was around. and thats the answer. I believe Aladdin is in the past. The technology and the architecture, along with their outfits and gender roles for the time (ie Jafar’s comment about speechless women) make this movie out to be set in ancient times. I admit the Genie may appear to be from the future with his phrases, impersonations and Disney Easter eggs. But he’s a supreme immortal being with cosmic powers in a tiny living space. Of course he will be rambunctious. Being cooped up so long for so long made him a little nuts. Wouldn’t you be the same way? So, no. 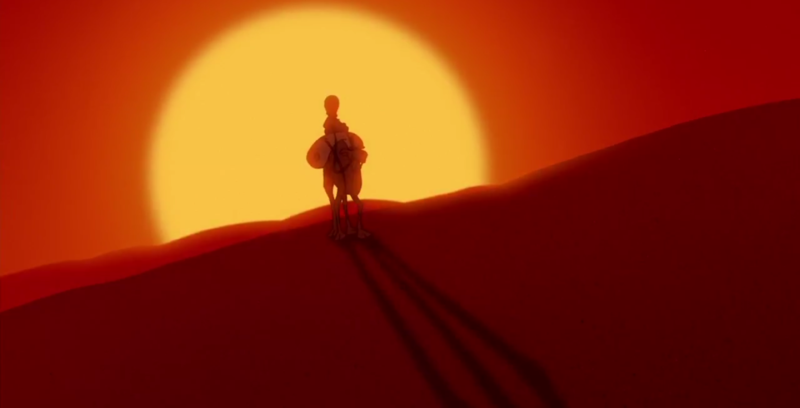 I don’t believe Aladdin is set in a post apocalyptic future. What if Genie just knows the future? He is you know… magical? He has “Phenomenal Cosmic Power”. I don’t think Alternative Theory #2 is a theory at all, it’s right there in the movie. The movie is definitely a story he’s telling you in order to sell you the lamp. Whether you believe him is another thing. Would it be possible that the explanation of stories being in books form merlin’s library? It is possible that he was just leaping through time chronicling all of his favorite stories in the disney universe, maybe to try and nudge them along, or even provide a psuedo-nostradamus effect. Honestly, I’m more prone to believe the theory that Belle is referencing her own story when she’s speaking/singing of the book she loves so much. 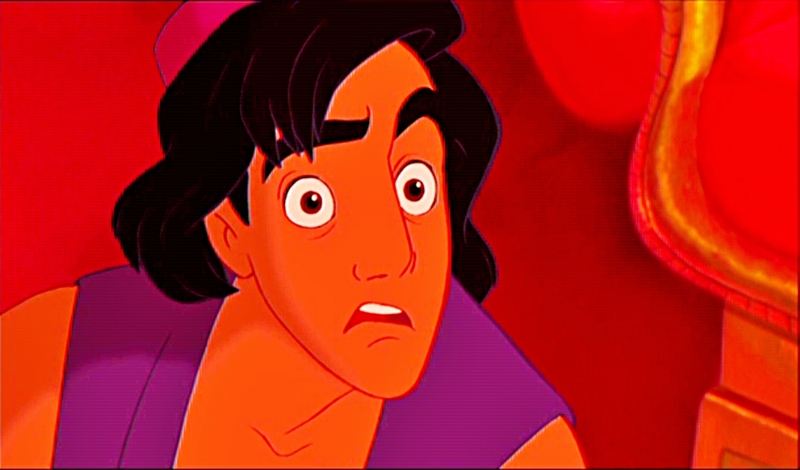 As for Aladdin being post apocalyptic, I call shenanigans on that one. The way I’ve always viewed that movie was that merchant at the beginning of the movie is really Genie in a disguise and he’s setting it all up to tell you how he met Aladdin and crew and the story of him being granted his freedom. I’ve also always thought of Genie more as a time wizard but with no real control over what century or era he’s gonna wind up in because the lamp appears to people who need it most and him also being a bit on the schizophrenic scale somewhere (I mean seriously wouldn’t you be a bit nutty if you’d been trapped inside a lamp for the past 10,000 years), hence how he has knowledge of all of the pop culture references he makes that don’t really seem to make sense to the other characters in the movie. I’m not sure what I believe. It’s nice to have these theories running rampant. It’s very entertaining. I think that it’s set in the past and Genie can move through time and the lamp is available to those who need it most, which is why Aladdin was the only one who could get the lamp. But time isn’t linear for the genie, which is why he has knowledge of different centuries. It has to be set around the time the Sphinx was built because they fly by it in their duet, causing the sculpter to mess up the nose. I also have this weird theory that only works with the first movie that Jafar is schizophrenic and Iago doesn’t actually talk to him. He just needs someone to be his friend to brainstorm his evil ideas with. You know, he’s not all there. 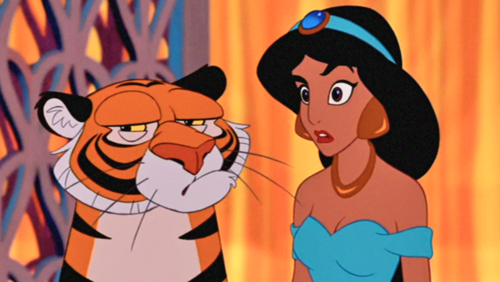 What if Agrabah is a whole different planet? That would explain why Genie talks futuristically and MANY other theories. The creators of the movie don’t want us to take certain actions of the genie seriously. They were being funny. Wouldn’t it make more sense the Geni can time travel considering he is magical? Also, it’s been confirmed that the merchant is, in fact, the genie. If we want to get really weird, I think the movie Aladdin is set in the past, based on the sphinx fly-by, but then who built the cave of wonders 10,000 years ago? And then buried it? I believe it could have been a past civilization as advanced or more advanced than the Atlantis people. That bug/magic scarab that Jafar puts together could be a robot with a built in GPS that leads you to the location of the cave of wonders, which may had been an ancient castle to a long deceased king with lots of wealth and his most prized item was the genie lamp. (Or it could have maybe been even the genie’s house before he wished himself to be a genie by another genie, considering he is already friendly with the carpet.) The whole cave melting upon Abu touching anything in the cave may had been just a highly brutal sensor-based security system, much like when if you touch anything in some museums, an alarm sounds. they were just pop culture refrences not meant to be taken seriously and Belle’s story book was totally refering to her own movie. Like, come on! 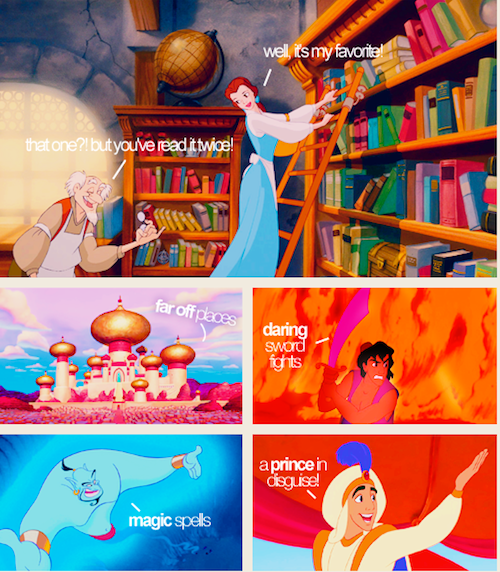 Disney made up Agrabah, because hey, why not? If they were to use a real place in the middle east, they would end up having to be a ton more historically accurate. And Iago is the product of disney. Like please, the mice in Cinderella could talk. And there are such things as tame tigers. And the magic carpet? Why this is easy. If magic exists in Aladdin a MAGIC carpet can exist. geez. Dude at the beginning? Product of a genie with too much freedom. 🙂 done. debunked it like a boss. You’re forgetting that the world of Aladdin, despite being hot during the day, can get (presumably) cold at night. This is due to a nearby region called the “ends of the Earth” where Jafar sends Aladdin, Abu and the Carpet at the climax of the movie. This frozen wasteland was the “ground zero” of nuclear blasts, causing what’s known as a “nuclear winter” which happens when nuclear weapons cause so much dust and smoke that the sun cannot touch the earth or atmosphere. If Jafar sent Aladdin all the way to the south pole he would have died from the cold LONG before Carpet got them back to Agrabah. I know it’s crazy but it’s still far more logical to assume this theory is (at least somewhat) true than to take for granted that a middle-eastern man with a thin vest and a fez stayed alive in the Arctic for more than 2 minutes. After reading this, I have two possible scenarios. 1. Aladdin is in a post apocalyptic future, and all Disney movies take place in the time after that, once society has been rebuilt, which could help explain where Disney magic comes from (combinations of technology from the past and genetic mutations) or 2. Aladdin is in a post apocalyptic future, and the genie uses his ability to move through time and goes back and writes the book belle is reading, also explains his trip to disney, he went back in time to go there. Theory 1 could explain a few things, like the magic mirror, actually a remnant of technology, like a digital assisassistant with an AI program that’s connected to government sattelites which is how she can have the mirror view sleeping beauty.